Cover by JBS and Studio Awoha. Edition of 300 copies. 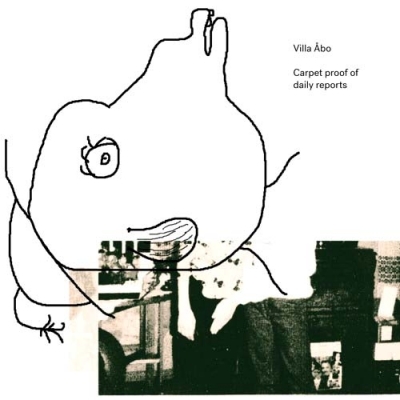 Villa Åbo is more than a band name. It is a former bank buliding in Johannishus in South East Sweden which was where Börft Records was founded and where the boss Jan Zwarre Svensson grew up. It was where the original location of Studio Styrka was and where the first important years of recordings by FRAK and Alvars Orkester was done. It was a creative volcano, and also a social meeting point for likeminded, teenage weirdos into electronic music. Villa Åbo is the foundation for a lot of stuff still resonating today. The story of Villa Åbo started in 1997 when the now collectable ”Ticketiketas” 12” saw the light on Börft. Zwarre had done dance stuff before as FRAK but now blew our minds with this funky, experimental acid techno acid thing. Villa Åbo immediately became an obsession for me. The same year the ”Tagetes” 2x12” came out and it had some quite amazing house elements to it. Zwarre had been into cheesy Chicago house for years and was often found playing Strictly Rhythm 12”s at parties but it still came as a nice surprise. Today, FRAK has been active for a long time now releasing tons of records, Alvars Orkester is asleep but about to be awaken, and Villa Åbo is the output for his addicion to deeper electronic dance stuff, with killer releases on labels like Butter Sessions, Dark Entries and Noise In My Head. "CARPET PROOF OF DAILY REPORTS" is a six track Long Player that takes you through underground techno funk to mindmelting ”Brain Charter Disco”. Step inside of the world of Villa Åbo! You wont regret it. - Joachim Nordwall, iDEAL Recordings, December 2018.